This is the World's smallest country (according to a chappie on tv just now discussing secret societies). It is the Sovereign Military Order of Malta: or, more fully, the Sovereign Military and Hospitaller Order of St. John of Jerusalem, Rhodes and Malta. I will have to read up on it to expand this later. O.K, the question is: "what constitues a country?". 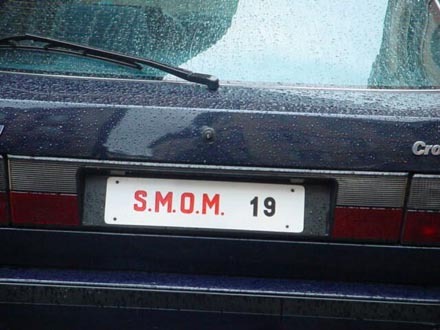 SMOM has a territory which is an enclave of Italy within Rome, just as the Vatican City does. However, the territory of SMOM is limited to one building and a courtyard, a size of 6,000 sq m and so much smaller even than the Vatican. SMOM (possibly) only has three residents with SMOM passports: the Grand Master, the Deputy Grand Master and the Chancellor. Although the Order has many more members, these are citizens of their native countries. SMOM is a sovereign entity in international law and has diplomatic relations with either 75 or 92 countries (depending on which source one reads) and has permanent observer status at the U.N. It even has two flags. One is red with a white Maltese cross whilst the other is essentially the same as the English cross of St. George with the red and white reversed. It also has its own number plates. However, some people say that the territory in Rome is nothing more than an embassy and thus SMOM has no territory, no citizens and no economy. Although it issues both coins and stamps these are for ceremonial rather than economic use. Although it does have oberver status at the UN, so does the Red Cross which no-one would claim is a country. SMOM is the remnants of the once very powerful Knights Hospitaller who cared for ill pilgrims during the first crusade. They have a long and complicated history having resided in Jerusalem, Cyprus, Rhodes and Malta. So how does somebody get to be Grand Master of such an order? Long service, and knowing the right people, I guess! It does not meet the criteria for being an independent country. It lacks territory, a permanent population, police power, and has no economy. The criteria for being an independent country. 1 Has space or territory that has internationally recognized boundaries (boundary disputes are OK). 2 Has people who live there on an ongoing basis. 3 Has economic activity and an organized economy. 4 Has the power of social engineering, such as education. 5 Has a transportation system for moving goods and people. 6 Has a government that provides public services and police power. 7 Has sovereignty. No other State should have power over the country's territory. That above is a very useful set of criteria, however there is nonetheless some debate. I'm not saying that SMOM are a country, but they're an interesting entity nonetheless. ...whilst the other is essentially the same as the English cross of St. George with the red and white reversed. Yikes! That's so close to the Danish flag they must have a hell of a time whenever the danes do a diplomatic blunder. I think the panels are rectangular and equal size on this one, whereas the Danish have square red panels on the flagpole side. It would be quite interesting to know how much juristiction Italy has within the SMOM building. The stamps of San Marino and Vatican City have postal validity. SMOM stamps would probably fall into the same catagory as Lundy or Herm Island. It would be QI to find out which country(ies) pushed for SMOM's UN status and why, or are we venturing into Dan Brown territory? The discussion does raise a QI point as to what constitutes a country? The eight points in djgordy's list would not fit Monaco Scotland or Wales. External recognition presents a political minefield. On the list SMOM scores 5/8. SMOM has two buildings in Rome. The Palazio Malta where the Grand Master lives and its governing bodies meet could be interpreted as the SMOM state whereas its building on the Aventine functions as an embassy to the Holy See and the Italian Government. The Italians appear to treat SMOM as an extraterritorial entity. Venice had such an arrangement in Constantinople in the 14thC. In the early 20thC European powers in Shanghai also claimed extraterritoriality (ie exempt from local administration). The Castel Gandolfo is also an extraterritorial area within Italy. The USA had a similar arrangement in Morocco until 1957 and maintain their controversial base at Guantanomo Bay in similar circumstances. The USA ... maintain their controversial base at Guantanomo Bay in similar circumstances. Cuba isn't daft enough to try and repossess Guantánamo Bay just now. But once the jail there has been closed, there have been a few hints that Habana may try and terminate the American lease on the site. And it does rather have the law on its side. Cuba claims that its then government only allowed the USA to rent the site in 1903 because of American threats of force; if true, this would render the lease invalid under the Vienna Convention. Further, the treaty which set up the lease allowed Gitmo to be used only as a naval base and as a coaling station; Cuba's contention is that a jail is not an accepted function of either of those types of establishment, and that hence American has broken the terms of the lease. Oh, and the USA seems not to have paid the rent ($4,085 per annum) since 1959. I understand that the US Government does pay the annual rent cheque but as it is made out to the Republic of Cuba, Castro apart from one year, has not cashed any. The base was established in 1898 following the US defeat of the Spanish. The 1903 Treaty said that the lease can only be terminated if both parties agree. Somehow I cannot see the USA voluntarily departing. Castro's claim that it was a treaty agreed to under threat of force forgets that the US granted Cuba's independence and determined the terms of it, as such Cuba's own constitution permitted US involvement in foreign relations and economics, and the Vienna Convention that he cites was drafted in 1969 and says it does not apply to existing treaties. While it looks bad, and it clearly set up Cuba as a satellite state, this was done because many feared European imperialism, particularly a return of the Spanish, would threaten Cuban independence. That this constituted American imperialism was not lost on some. Given Spainish and later Soviet interest in the region, it wasn't unfounded. Also, in 1898 there was great interest in Cuba entering the Union as a state; mostly from economic interests who wanted to avoid tariffs on sugar (see Hawaii). That the constitution and treaties were quite favorable to the US as its #1 trading partner is no surprise. What was a surprise, and still is to some Americans, was how well Cuba could manage through 50 years of embargo. Yes, I think I'd have to agree that that part of the Cuban argument doesn't really hold water. But the part of the Cuban argument which says that the US has violated the treaty by using Guantánamo in ways other than those permitted does - on the face of it at least - stand up rather better. In 1901, U.S. Senator Orville Platt introduced an amendment to the U.S. Army appropriations bill specifying several conditions for the American military evacuation of Cuba. The two key provisions of the Platt Amendment, first proposed by Secretary of War Elihu Root, required that Cuba cede territory for American military and naval bases and also grant the United States the right to intervene in the island to preserve order, life, property, and liberty. In Congress, even proponents of Cuban independence like Senators Joseph Foraker and George Hoar supported the amendment, which President William McKinley signed into law on 2 March. In early June, the Cuban Constitutional Convention acceded to American demands, and the amendment came to regulate Cuban‐American relations until it was abrogated in 1934. The Platt Amendment addressed a fundamental problem for the expanding United States. In 1898, the U.S. government had pledged under the Teller Amendment to withdraw from Cuba once Spain had been defeated in the Spanish‐American War. But after the U.S. military victory, Washington wished to maintain the strategic gains of 1898 and did not trust the Cubans to establish a government friendly to American interests. The Platt Amendment resolved this contradiction by in essence making Cuba a U.S. protectorate. However, the amendment also poisoned Cuban‐American relations and encouraged U.S. expansionism in the Americas in the early twentieth century. The US had no right to grant independence or write laws in Cuba - they were an occupying force at the time. Even if they ousted Spain - it was originally done as "liberators" on the back of their own self-interest. I'd be interested to understand why Senator Platt of Connecticut should feel he could amend the Cuban constitution. At the end of the US-Spanish War there were many US politicians and business people who wanted Cuba and neighbouring Puerto Rico to become US states. Platt like many US politicians feared a revolutionary anti-US government being established on the Cuba. Defeat of the Spanish also potentially created a political/economic vacuum which US interests were desperate to fill. Senator Orville Platt was protecting US interests in Cuba and was instrumental in the pro-US Tomas Estrada Palma becoming the first president of an "independent" Cuba. Estrada had originally wanted the island to become part of the USA. Arguably one could argue that he was one of a number of "puppet" rulers in "America's Backyard". Although adopting similar flags the islands followed different paths. The relations between Cuba and the US were always set in a way that favoured the US. For example Cuba was prohibited from transferring any territory to any power except the US. All of this favourable US concession was rejected by the new Castro Government. While Guantanamo Bay is a relict of a bygone age, in an odd way its continued status could be said to reinforce the Cuban Government's claim of US imperialism.